Cod is popular as a food with a mild flavour and a dense, flaky white flesh. Young Atlantic cod or haddock prepared in strips for cooking is called scrod. 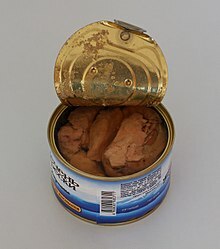 Cod's soft liver can be canned or fermented into cod liver oil, providing an excellent source of vitamin A, vitamin D, vitamin E and omega-3 fatty acids (EPA and DHA). Cod flesh is moist and flaky when cooked and is white in colour. In the United Kingdom Atlantic cod is one of the most common ingredients in fish and chips, along with haddock and plaice. Cod can be easily turned into various other products, such as cod liver oil, omega pills, etc. Haddock is a very popular food fish, sold fresh, smoked, frozen, dried, and, to a small extent, canned. Haddock, along with cod and plaice, is one of the most popular fish used in British fish and chips. Because of its slightly gray color, pollock is often prepared, as in Norway, as fried fish balls, or if juvenile sized, breaded with oatmeal and fried, as in Shetland. Year-old fish are traditionally split, salted and dried over a peat hearth in Orkney, where their texture becomes wooden and somewhat phosphorescent. The fish can also be salted and smoked and achieve a salmon-like orange color (although it is not closely related to the salmon), as is the case in Germany where the fish is commonly sold as Seelachs or sea salmon. In Korea, pollock may be repeatedly frozen and melted to create hwangtae, half-dried to create ko-da-ri, or fully dried and eaten as book-o. Ackee and saltfish Jamaica Salt cod sautéed with boiled ackee, onions, Scotch Bonnet peppers (optional), tomatoes, and spices, such as black pepper and pimiento. It can be garnished with crisp bacon and fresh tomatoes, and is usually served as breakfast or dinner alongside breadfruit, hard dough bread, dumplings, fried plantain, or bogreen bananas. Jamaica's national dish. Bacalaíto Puerto Rico and Dominican Republic Salt cod fritters filled with minced cod fish and garnished with cilantro, tomatoes and onions. A traditional snack typically eaten with an entire meal. Bacalaítos are served at the beach, cuchifritos, and at festivals. They are crisp on the outside and dense and chewy in the inside. Made with speldings, young fish of the Gadidae family such as cod, haddock or whiting. The name is a derivative of cabillaud, the French name for cod. Other ingredients include parsley, horseradish and mashed potato. The sauce is made with butter, flour, milk, hard-boiled eggs, and nutmeg. Alternate versions outside the traditional version's only difference are usually an addition of more spices. Bacalhau à Brás Portugal Made with eggs, onions thinly sliced, potatoes in matchstick-size, salt codfish, soaked, minced garlic clove, extra virgin olive oil, bunch fresh parsley, chopped black Portuguese olives, salt and pepper. Cullen skink Scotland Thick soup made of smoked haddock, potatoes and onions. An authentic cullen skink will use finnan haddie, but it may be prepared with any other undyed smoked haddock. The soup is often served as a starter at formal Scottish dinners. It has been described as "smokier and more assertive than American chowder and heartier than classical French bisque". ^ Smithers, Rebecca (2009-04-06). "A colin and chips? Sainsbury's gives unfashionable pollack a makeover". The Guardian. London. ^ ""Has cod had its chips? ", BBC News". 2000-07-20. Retrieved 2010-01-04. ^ "Mrs. Beeton's Fish Recipes Revisited, TheFoody.com".